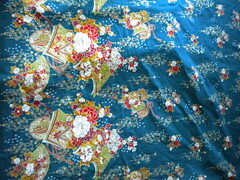 I wanted some fun cloth napkins in an interesting print. Surprisingly hard to find and have them not be ridiculously expensive and/or flimsy! I ended up making my own instead, total cost about $12- one large sheet and a large printed fabric, both in a nice tight weave. 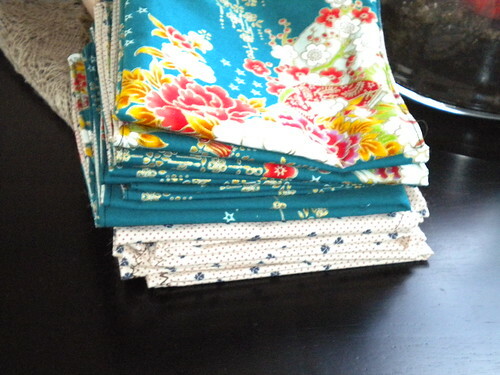 You could of course do it for much less, but I was being picky about my prints and wanted fairly large amounts of fabric since I made 8 of 2 different designs, each napkin being 13x13+ or so. 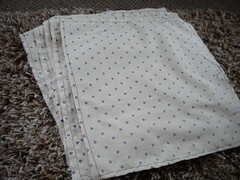 The one set of napkins is the teal (which has metallic gold print) backed with the dots print, the other is both sides in the dots. 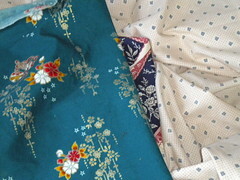 I did two sided ones because I think it is faster than adding a binding or ironing hems neatly. Since I am not the biggest perfectionist- and lack a rotary cutter since I don't do tons of sewing usually, I made a simple template about 14x14 inches and cut out stacks of fabric (washed and ironed) at a time. I won't say it results in perfect edges- or that I bothered to sew them perfectly either, relatively straight will do- but the matched up, so all set to go! 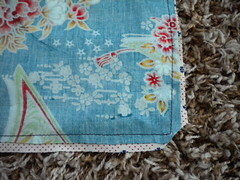 I leave a two inch or so gap in the center of one side when I sew the pieces together- right sides in of course! Make sure to reinforce the edges by going backwards and forwards- prevents unraveleing and tearing the stitches when you turn them right side out. 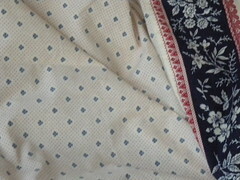 I cut the corners off to create more pointed edges, and use a knitting needle to poke out the edges. 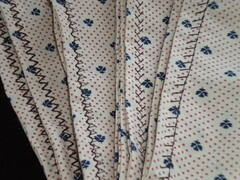 I don't bother to sew the open edge shut, I just make sure the edges are tucked to the inside while I am ironing the napkins after turning right side out, and the seam I sew around the edge holds the edges in place. 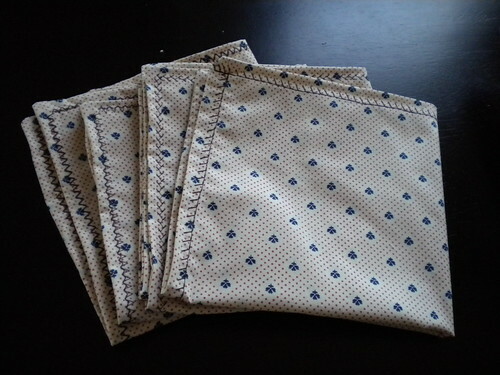 I used a different stitch on each of the double dots one to make each napkin a little different- the second one from the top is my favorite, though it tends to draw the fabric in a bit. Not a big deal for napkins though. 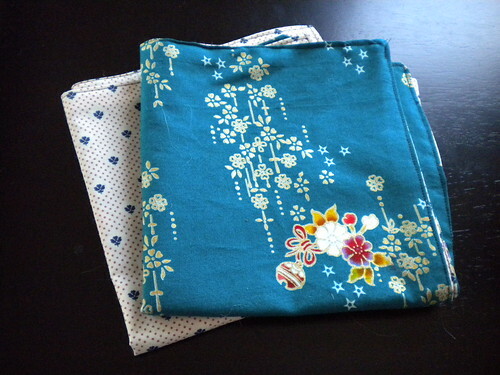 I used plain stitching closer to the edges for the teal napkins- generally, I think it gives a fancier look to have a smaller hem, but the 1/4 inch hem is better with the different stitches. 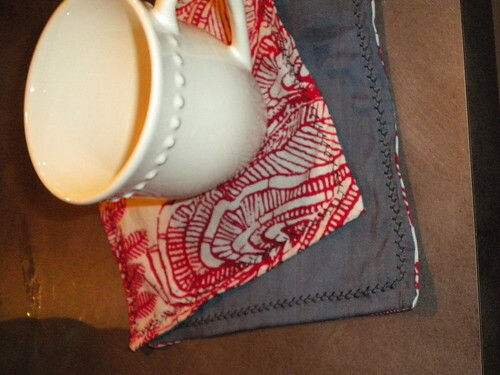 I tested the napkin making idea on some shirt fabric from old shirts before buying fabric- the dark blue is a dress shirt that I got printer toner all over that I then dyed with indigo.